Muscle mass, strength, and muscle cell function decrease with age. Aging causes loss of functional motor units (nerve and muscle cells), abnormal mitochondria (cell energy centers), nerve cell death and DNA destruction. Gradually, muscle cells lose the ability to repair damage, which causes further deterioration in muscle function. Weight training can partially restore lost muscle function in older adults. 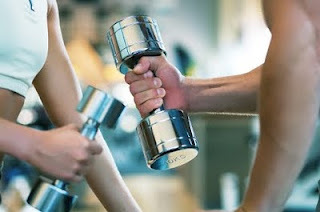 Mark Tarnopolsky and Adeel Safdar from McMaster University in Canada, in a review of literature, concluded that the combination of weight training and creatine monohydrate generated satellite cells that had the characteristics of young muscle. The satellite cells are integrated into the old muscle, which reverses many of the effects of aging. Adding conjugated linoleic acid supplements helps decrease body fat and increase lean mass. Creatine supplementation combined with weight training increases muscle nuclei (the genetic centers of cells), which also has the effect of making muscles "younger." They concluded that the combination of weight training, creatine monohydrate, and CLA has important anti-aging effects, but is not known how long these changes can be maintained.